Warning! Sorry, property # 672 unavailable now! One for the ‘familia’ – bring the wife, bring the kids, bring the in-laws as this stunning and handsome family retreat will tick every single box. Prestigiously positioned located on a lush tree-lined block in Gravesend, surrounded by other high-end homes, here is one sensational property, immaculate in every meaning of the word, featuring a floor plan dedicated to the needs of today’s family and lifestyle. Presented over two grand levels, you’ll be utterly spoiled with the choice of gorgeous in and outdoor areas, all which combine to supply you with the ultimate family home. Displaying designer luxury and taking full advantage of its size and sunny east-west exposure, there is a huge formal living room accented with high ceilings, casual dining area and a garden style courtyard which is overlooked by the crisp pristine custom kitchen where you can see the kids at play in the safely enclosed garden area – every Mom’s wish and so hard to find these days. In addition, this well-appointed brick townhome is equipped with a built garage, full size finished family room with a full bath and can be accessed thru a separate entrance. 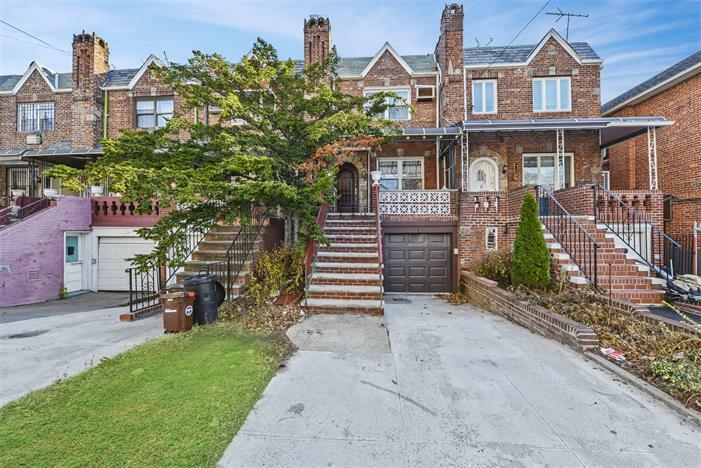 This is a rare and exciting not to mention affordable entry into one of Brooklyn’s most stately family neighborhoods. Please contact AmeriHomes Realty at 718.676.9670 to schedule a private tour.